MASVINGO-Great Zimbabwe, Masvingo City and Landmark pool clubs members have won the right to represent the Province in the forthcoming Carling Black Label National Pool Tournament (CBL) finals to be held in Bulawayo on November 24. The provincial finals were held last week at Victoria Hotel where over 70 players in the female and male categories battled it out for the coveted prize. Solomon Feya of Landmark Club came tops in the men’s category and walked away with $200 while Tinashe Mangombe of Masvingo City Club came second and bagged $100 and a ticket to the finals as well. In the female category Monica Mhokore from Chivi Growth Point who plays under Great Zimbabwe Club came out tops and walked away with $100 and a sole ticket to compete at the nationals. 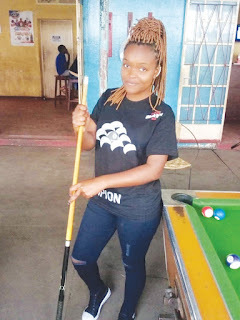 Mhokore who is a first timer at the nationals said she has intensified her training as she aims to bring home the gold medal. “I have a reputation to uphold when I compete at the nationals. Last year finalist Patience Pasipamire put us on the map when she scooped silver in the female category. I am training hard to surpass her,” said Mhokore. Last year provincial competitions were won by John Mafadza and Pasipamire who represented the province at the finals that were held in Gweru. CBL tournaments are organised by Zimbabwe Pool Association (ZIPA) and sponsored by Delta Beverages through its Carling Black Label Beer brand as part of its consumer-based initiatives.